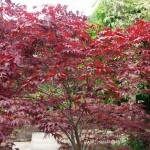 This is a good time for selecting trees to provide special interest in your garden. If you plant them now in late winter, they will establish well. Choose those which have at least two seasons of interest. This can be spring foliage and flowers, autumn colour and winter structure. 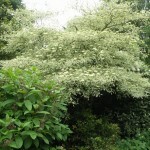 There are several Cornus varieties which are great – alternifolia ‘Argentea’ has tiered branches with white variegated leaves. 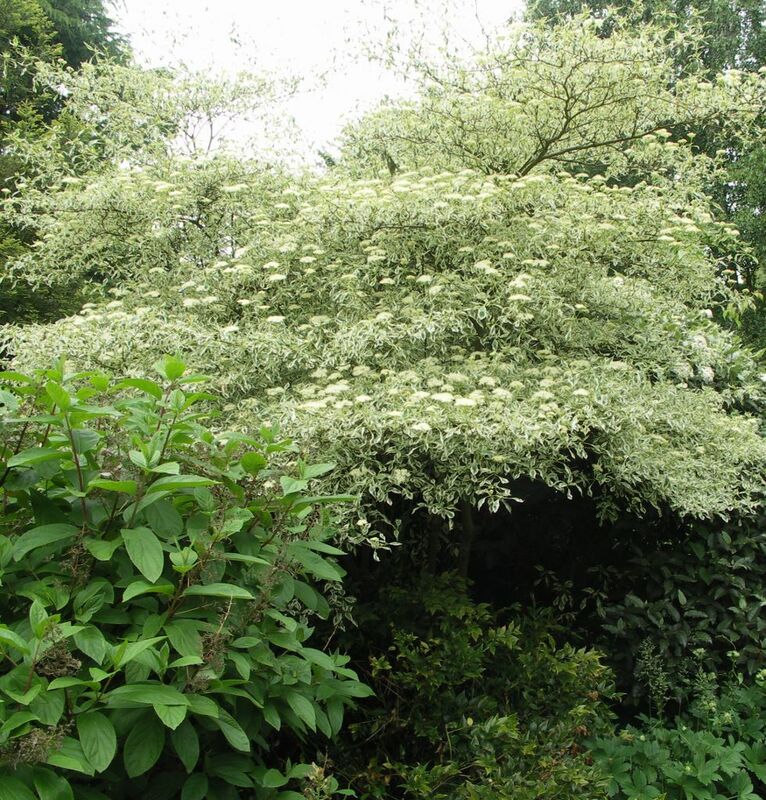 Cornus kousa ‘Venus’ has pale pink long lasting bracts and Cornus controversa ‘Variegata’ – the wedding cake tree is spectacular. Underplant them with narcissi, alchemilla and astrantia to have flowers from early spring through summer. 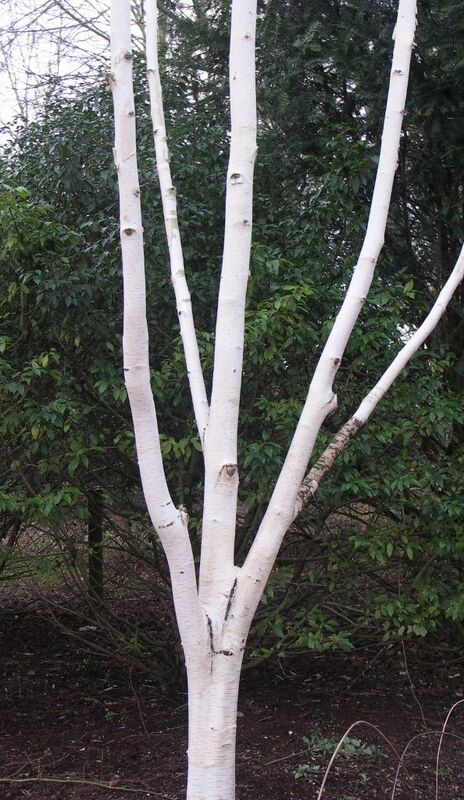 Stunning bark and an open habit make birch trees a good choice. They can be multi-stemmed and perhaps the most used in contemporary gardens is Betula utilis var. 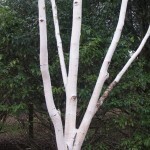 jacquemontii for its bright white bark. Underplant them with contrasting purple bergenias, snowdrops and spring bulbs. 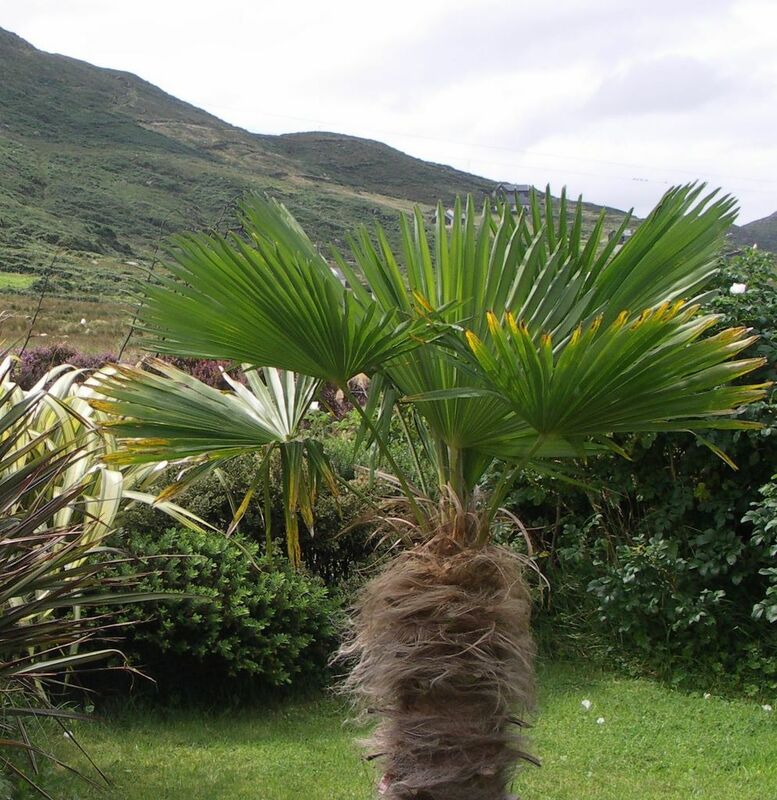 For a tropical feel in a sheltered spot, think about the hardy Chusan palm, Trachycarpus fortuneii which has large fan shaped leaves. It is good in town gardens and here by the sea, it has some protection from the wind provided by phormiums and a rose hedge. After bad winter storms, it gets tattered but recovers again with new shoots from within. The Dwarf fan palm Chaemerops humilis is a good choice for a sunny sheltered border but is frost tender. Cordylines are great in mild coastal areas and come in a range of reds and greens, starting as small shrubs and growing to a tall cabbage palm tree. A much hardier palm is the Chilean wine palm, Jubaea chilensis with a large trunk and striking large silver green leaves. Slow growing blue-green Irish juniper provides a strong vertical accent. 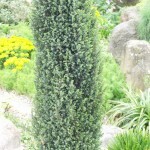 Fastigiate or narrow vertical tree forms provide interesting accents to plant borders. 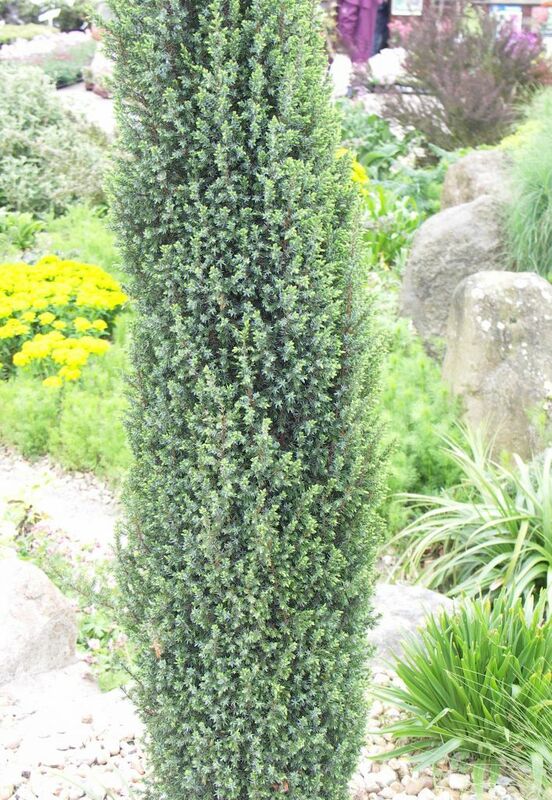 Juniperus scopulorum ‘Skyrocket’, Juniperus communis ‘Hibernica’, and the Italian cyprus, Cupressus sempervirens ‘Green Pencil’ can be used singly or in striking groups. Japanese yew, Podocarpus macrophyllus and Irish yew,Taxus baccata ‘Fastigiata’ are slow growing and can also be used to emphasise gateways and entrances. 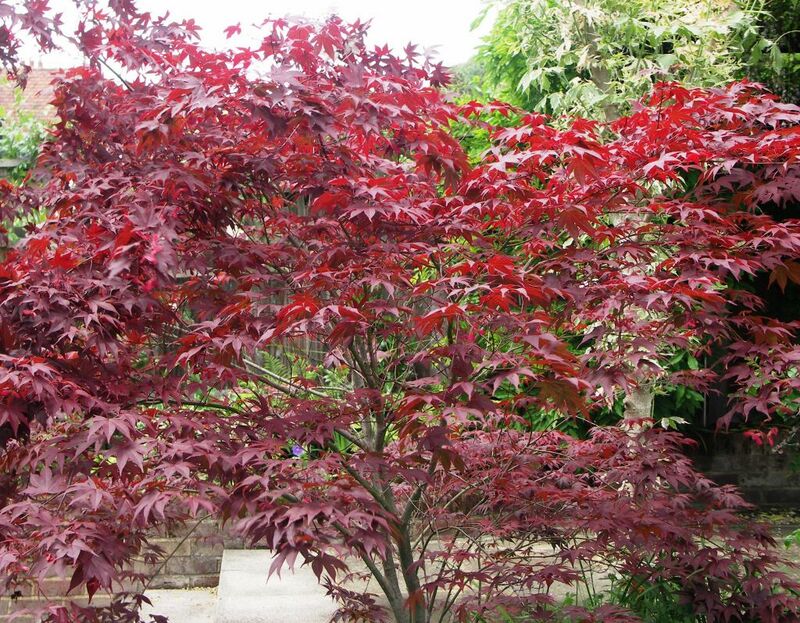 For purple foliage, Acer palmatum ‘Atropurpureum’ is hard to beat. 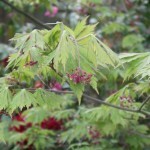 Acer palmatum ‘Shaina’ is a lovely rounded tree with pinkish red foliage. 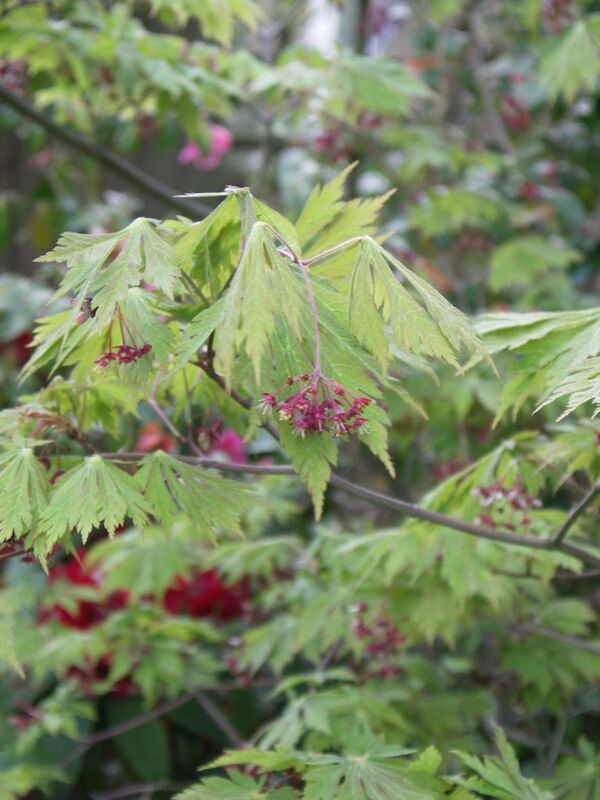 Acer negundo ‘Flamingo’ is a larger tree but can be pollarded to give the best pink-flushed variegated leaves. For good bark try the snake-barked Acer davidii ‘George Forrest’. This entry was posted in Selecting Trees and tagged Acer japonicum, Acer negundo, Acer palmatum, Betula utilis, Cabbage palm, Chilean wine palm, Chusan palm, Cornus alternifolia, Cornus controversa, Cornus kousa, Cupressus sempervirens, Dwarf fan palm, Garden Design, Juniperus communis, Leaf & Acre, marine, North London, Planting Design, Podocarpus macrophyllus, seasonal interest on February 25, 2014 by admin.